The anarchist Emma Goldman (1869-1940) is perhaps best known today for one quote attributed to her: 'If I can't dance I don't want to be in your revolution'. It seems that she never actually said these words, but in her autobiography Living My Life her joy in dancing is obvious. At one point she recalls her first ball in St. Petersburg, aged 15: "At the German Club everything was bright and gay... I was asked for every dance, and I danced in frantic excitement and abandon. It was getting late and many people were already leaving when Kadison invited me for another dance. Helena insisted that I was too exhausted, but I would not have it so. "I will dance!" I declared; "I will dance myself to death!" My flesh felt hot, my heart beat violently as my cavalier swung me round the ball-room, holding me tightly. To dance to death - what more glorious end! It was towards five in the morning when we arrived home". After moving to the United States, she was involved in supporting a strike by Jewish women cloakmakers in New York's East Side in the 1890s, including dances for the strikers: 'At the dances I was one of the most untiring and gayest. One evening a cousin of Sasha [Alexander Berkman], a young boy, took me aside. With a grave face, as if he were about to announce the death of a dear comrade, he whispered to me that it did not behove an agitator to dance. Certainly not with such reckless abandon, anyway. I grew furious at the impudent interference of the boy. I told him to mind his own business, I was tired of having the Cause constantly thrown into my face. I did not believe that a Cause which stood for, a beautiful ideal, for anarchism, for release and freedom from conventions and prejudice, should demand the denial of life and joy. I insisted that our Cause could not expect me to became a nun and that the movement should not be turned into a cloister. If it meant that, I did not want it. "I want freedom, the right to self-expression, everybody's right to beautiful, radiant things." Anarchism meant that to me, and I would live it in spite of the whole world - prisons, persecution, everything. Yes, even in spite of the condemnation of my own closest comrades I would live my beautiful ideal'. So even if 'Red Emma' didn't say the exact words put into her mouth on posters and t-shirts, it would seem that they were a fair enough representation of her stance. 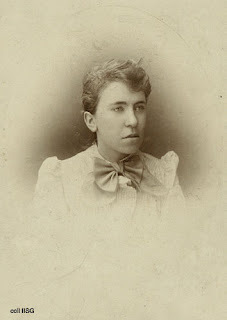 The picture of Emma Goldman was taken in around 1886 shortly after she left Russia in the wake of anti-semitic pogroms.